Known Relatives: Unnamed woman as source for its biological parts. Height: 1’2” Weight: 25 lbs. The robot named 790 is designed for analytical work. As such, it is an expert at computers, electronics and other scientific fields. It is also a most capable astronavigator, and tends to be able to get the LEXX to any desired location. 790 is the robot, or robot head anyway, that suffered the personality adjustment that Xev was supposed to get, after his body unfortunately got eaten by a Cluster Lizard. The personality adjustment meant that he fell totally in love with Xev at first sight, and was besotted by her. He therefore joined in with the crew of the LEXX and served as their science officer (of sorts) for many years. After having been destroyed and rebuilt in the dark universe, his affections changed to Kai, the last of the Brunnen-G instead. 790 remains an egocentric servant onboard the LEXX to this day. 790 is a shiny, metallic robot head. It lacks visible ears, but has large, shiny eyes, and a mouth, complete with small screens showing human eyes and a mouth. It seems to weight around 25 lbs, and cannot move around by his own power in any way, except when he is placed onto a small rolling board. Its voice is whiny. Even more so when it whines. Which is often. This robot has a disturbing personality. It is not nice, it is not helpful, but it sure has a big mouth. Its sole motivation for doing anything is if it affects Xev, whom it worships. 790 hates Stanley, who is the nearest thing to a rival that it has. But it tolerates Kai as he shows no interest in Xev and has in fact saved her life on a number of occasions. He has an unending store of terrible poetry, all of it about Xev, and makes Stan’s life a misery at every possible moment. His greatest desire is to find a headless body and attach himself to it so that he can make sweet sweet luve to his object of desire. In series 3 he suffers a nasty accident which leaves him rather broken after falling off the edge of the bridge. This means that Kai has to fix him. Unfortunately for Kai, as the little robot head re-boots it’s love slave programming also re-boots and now 790 is fixated on Kai. And thinks of himself as female. In game terms, its Irrational Attraction was transfered to Kai instead of Xev in the third season of the series. Also, given the high technology level, the LEXX with crew fits well in the Legion of Super-Heroes era. Or even better, directly after one the major world wars to have preceded that era had ended. An era that was until then ruled by the tyrannic Shadow, ruling many of the planets to later form the United Planets network. SL: Gadgetry is Always on, making it into a robot (-1). Area Knowledge (The Light Universe), Scholar (Astronavigation), Scholar (Computers), Stroke of Genius (Astronavigation and Computers). Kai the last of the Brunnen-G (Low), Zev/Xev Bellringer (High). SIH (Stanley H Tweedle), CIA (Xev/Zev Bellringer or, later, towards Kai), CPR (790 possesses no body; it is a non-mobile metallic head, and often carried around by Zev), Forced Exile (Dark Universe, after the 2nd season only). Mobile board [BODY 01, Running: 01, R#5, Notes: 790 can roll around when attached to this board. If distracted, 790 has to roll Reliability, failure meaning that it falls off and remains lying on the floor.]. 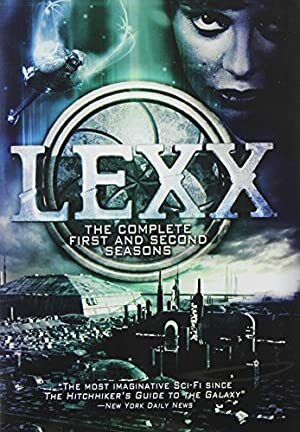 Source of Character: Lexx TV-series.